Note to self: blog more. It's been an unconscionable while since your last post, and you always have some random observation to make that someone will chance to read and hopefully enjoy. As I noted on Facebook today: April is National Poetry Month, but has only been so since 1996; T. S. Eliot can't be blamed for deeming it the cruellest month in 1922. For me, poetry is the breath of life, and I'd never have become a writer without having grown up amid the beauty of words perfectly woven. 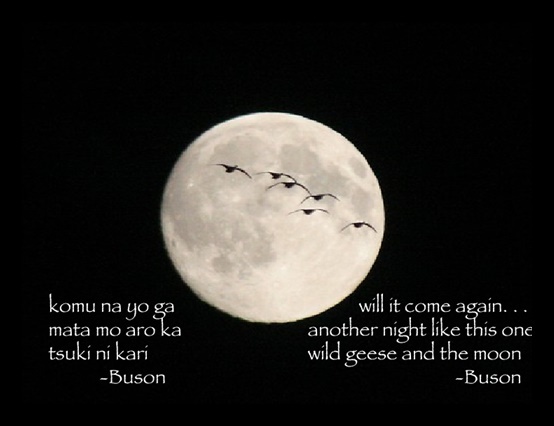 I'll celebrate with this haiku since my nickname is Kari, and in Japan kari is the name for wild geese, which symbolize transience. Yosa Buson lived from 1716 to 1784, and was one of the great poets of the Edo period.